As Ireland suffers through the worst housing crisis since the foundation of the modern Irish state, we continue to see public land being sold to private developers on which they will create more housing units which will be used, of course, to house people. As well, councils persist in supplementing the amount of rent some tenants pay to private landlords through the Housing Assistance Payment (HAP) scheme. 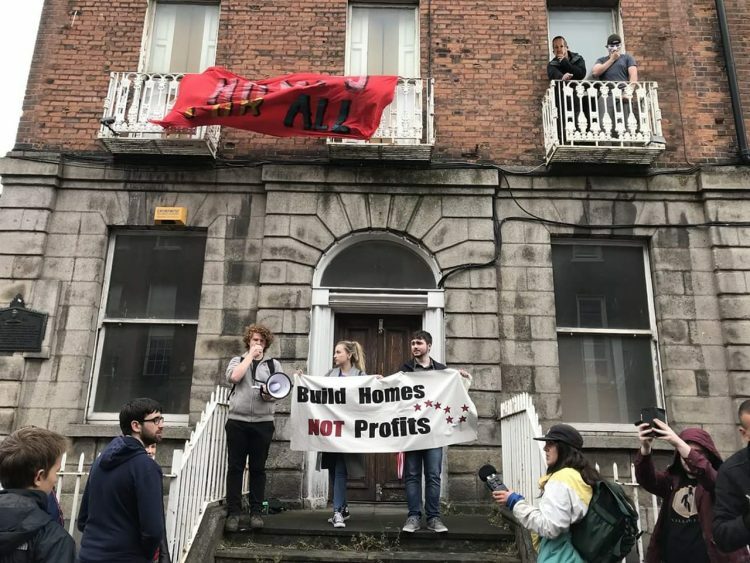 Although these may sound like a simple and quick fix solution, Ireland’s housing crisis goes much deeper than that, and requires the state to step in directly and take control of housing. The sell-off of public land to private developers would be slightly more understandable if it weren’t for the fact that people aren’t able to find a home because prices have gone through the roof. €320,000 for a house is categorised as affordable housing by Taoiseach Leo Varadkar and the Fine Gael government. Low to middle-income earners would struggle to afford a home at such rates. Meanwhile, local authorities give private developers the go-ahead to charge this and much more for homes, by selling public land to them often for little or next to nothing, knowing fully well that the houses built on what was once public land will be insufficient. This only creates homes that are unaffordable to the majority of those who need a home. Councillors voting in favour of this likely want to be seen to be doing something rather than holding out for a solution so as to keep their seat come the next election, but this quick fix is no solution to most. If it was any sort of solution to the housing crisis, it would have worked by now. Introduced in 2014, the HAP scheme is described as social housing support which requires people to qualify for council house waiting lists, search for accommodation in the private rental market, find a landlord who rents to HAP tenants (landlords can refuse to do this), and then if the terms which they’ve negotiated are acceptable to both the council and the landlord, the tenant then pays their rent to the local council, who supplement it to bring it up to the final figure agreed with the landlord. Although this may sound appealing to people looking for housing, landlords can actually use this scheme to their advantage at the expense of the tenant. Once it is asserted that the tenant avails of HAP, the landlord can use this fact as reason to increase the price of rent, using the logic that it won’t be the tenant paying it in their entirety anyway. This unfortunately drives the price of rent up, and in many cases makes housing just as unaffordable as it would be anyway. Additionally, renting to HAP tenants gives landlords increased tax relief, this allows “property owners to claim 100% relief on their mortgage interest, as an expense against rental income”, according to the HAP website. Landlords who accept HAP are also exempt from private rental standards inspections and tax compliance checks. All of this awarded for renting to HAP tenants, landlords, rather than social housing support recipients, are being given something for nothing here. As it stands, land sell-offs to private developers and the subsidising of landlords by councils through HAP are only worsening the housing crisis. In order to bring an end to the crisis, the state must stop selling off public land and instead must use it to build public housing. Public housing would see the state build housing on sites that it currently owns, which it would then rent out to tenants. This would be made universally accessible, meaning anybody who seeks to avail of public housing could. The price of rent would be tied to household income, which would see low-income households paying lower rates, medium-income households paying medium rates and high-income households paying higher rates. These rates would be affordable, giving tenants a sense of security that they do not have in the private rental market. Public housing is the only viable solution to this crisis, and we need both local government and Dáil Éireann to acknowledge that and take action to make it a reality.